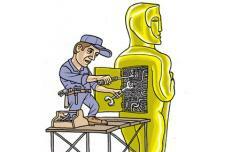 Slate readers’ best ideas (so far) for fixing the Oscars. Slate readers have offered dozens of suggestions to the Hive for ways to make the Oscars watchable (and relevant). As the Feb. 26 ceremony approaches, we wanted to highlight some of your best plans. Take a look at these ingenious schemes, then submit your own, explore the Hive, and vote for your favorites from now until Feb. 17. As for the problem of why the academy is so out of touch: Reader mchasewalker proposes the brilliant option of term limits for academy members. To stay a voting member of the academy, “you must have produced, directed, acted in, or actually participated in the physical act of filmmaking” in the past five years. Maybe that academy wouldn’t love The Artist quite so much. To fix the ceremony itself, readers have been dreaming big. While banning black tie would certainly liven things up, what about staging the awards American Idol-style, with the nominees onstage, eliminated one by one? Wouldn’t the speeches get better if, as user Jon Sternfeld was the first to suggest, each nominee had to turn in a list of thank-yous beforehand which would scroll underneath her presumably heartfelt, non-agent-and-manager-filled speech? And what if each year, every Oscar winner was obligated to collaborate with every other Oscar winner on a super-Oscar-mega-film, which would then compete for future Academy Awards? That sounds great, user Oli R.! But our favorite suggestion just may come from user Rabbit Ears, who’s gone ahead and drawn up the entire script for a dramatic production of this year’s Oscars that turns the entire ceremony into one exciting tension-filled story, complete with Hugo getting kidnapped, Tom Cruise chasing the best-picture envelope across the stage, and the best-actress winner saving the day. Would it be completely crazy? Yes. Would we watch it? Hell yeah we would.